I’ve been talking to readers a lot this spring, and one subject that kept returning was whether writers can work on many types of book, or if they should stay in one area. Crime was once a part of general fiction until genres separated out in bookshops, so that SF/horror, fantasy (and believe it or not ‘Paranormal Romance’, albeit mercifully briefly) all became genres. And writers either hop between genres or continue to mine one area throughout their career. But crime is the big one – crime sells. And crime allows for surprisingly big ideas to be smuggled in through an established style of story. That’s why so many so-called ‘serious’ writers try their hand at crime at some point in their careers. One of the joys of writing the Bryant & May series has been seeing how many ideas I could allow into what is basically a series of whodunnits. There’s been topicality, politics, social culture and satire mixed in with a continued theme of liberalism, anti-ageism and other ‘isms’, wrapped up in murder mysteries, together with plenty of humour. And lately I’ve even found a way to sneak in a form of time travel. Writers often become known for one thing. I’ve never become too identified with one success and have largely worked under the radar, so first I was ‘the Master Of Urban Unease’ (Times) for my volumes of short stories, then the ‘Machiavellian Trickster’ (Guardian) for my four satirical novels. Switching to the Bryant & May books I found new tags attached to my name, but part of me needs to keep exploring other areas in standalone books, which is why I wrote ‘Plastic’, ”Hell Train’, ‘Nyctophobia’ and ‘The Sand Men’ for Solaris. I was particularly gratified and surprised to find the last one so well received. These books help to keep me fresh. It’s interesting that ‘Plastic’, which must hold some kind of record for squeezing the most jokes into any one novel, has been my least successful book in years (although it has some ardent fans, most of them other writers). I love Bryant & May, though, and am happy continuing their adventures for a while yet. However, I’ve also been thinking about a spin-off series featuring a team of slightly younger, more female-led amateur detectives. Had ‘Plastic’ taken off I would have made its heroine, June Cryer, the lead. Meanwhile Bryant & May aren’t going away, and I can confirm there will definitely be another volume of missing cases as the last one, ‘London’s Glory’, was nicely received. The beauty is still having the freedom to choose what I do. 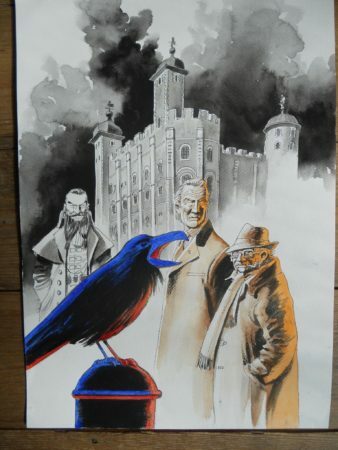 NB Another fine piece of art from Keith Page to illustrate ‘Bryant & May and the Bleeding Heart’. I had trouble with the King ‘noirs’ because it seemed to me that his naturally optimistic outlook prevented him from being truly dark. Did you hear that the ravens have a new area in which to feed because the gulls were stealing their food? I’m not sure about the security of a nation whose protectors can be put off by a bunch of seagulls. I really enjoyed Plastic! A tad disappointed that we have seen more of June Dryer! I’m probably being spectacularly dim, [APN], but I the logic in “Had ‘Plastic’ taken off I would have made its heroine, June Cryer, the lead.” is completely baffling, [at least to me]. While it exists as a complete work and putting the apparent ‘modest’ commercial sucess, [whatever that might mean, since I really have no idea], aside. Something about all characters needed a backstory. Having an origin story is a bit of a bonus. Something about all ‘births’ being a bit messy, [danger of getting a bit too graphic]. Better an interesting character, than just another ‘lantern jawed hero’ or ‘lissom heroine’ doing a variation on a story we have all read a hundred times before. I’ve enjoyed all your works in all genres but … your short stories are totally and absolutely enthralling. So, being selfish, I wish you could provide us with even more. I think I agree with Snowy – I think I do. It’s surprising how up beat some of the old pulps and noirs were, and as such I don’t have a problem with King, but then I’ve read some pulps noir that makes your toes curl and not for good reasons. As for June Cryer she can start as a minor character and work her way into the heart of a new series. She already has form. The sad thing is when people get trapped in genres and can’t explore other areas, Dickens wrote splendid ghost stories and they were accepted as part of his main cannon, it wouldn’t be allowed from a modern fiction writer today, sad really. There are some exceptions but they get harder to find.